Anthony V. DeAngelo is the President & Founder of Lionheart Wealth Management LLC. Anthony works with individuals and businesses to provide clarity to their financial situation and inspire them to live their lives by design. A New York native, Anthony was born and raised on Staten Island. He is a proud graduate of Monsignor Farrell High School & Wagner College earning a Bachelor of Science in Business Administration with a concentration in Finance (2007). His Wagner years prepared him well for his future career, and an unlikely coincidence introduced him to his future business partner – with whom he shares a name. They were spotlighted in the August 2016 edition of The Wagner College Magazine. 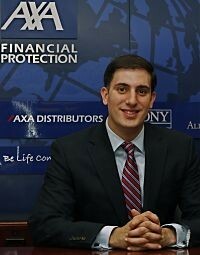 Anthony joined AXA Advisors LLC in 2009 and is a Retirement Planning Specialist (2013). Anthony has achieved several prestigious milestones at AXA Advisors LLC. He is a member of the Million Dollar Round Table (MDRT), Elite Producer Group (EPG), Peak Advisor Alliance, and is a 4-time earner of the Centurion Award. He holds the NASD Series 7, 24, 63 and 66 registrations. He is also a Registered Principal. Anthony is very community minded and serves on the Board of Wagner College's Young Alumni Steering Committee. He volunteers his time with the Dr. Theodore A. Atlas Foundation, and together with his wife Jennifer, supports research for Multiple Sclerosis and ALS, also known as Lou Gehrig's Disease. In his free time, Anthony enjoys traveling, concerts, sporting events, cycling and spending time with his family. A “foodie,” he is frequently spotted throughout New York City's restaurants. Retirment Planning Specialist title awarded by AXA Advisors, based upon receipt of a Certificate in Retirment Planning from the Warton School of the University of Pennsylvania.